When working with difficult-to-transfect-cells, use our lentiviral Cas9 SmartNuclease System. 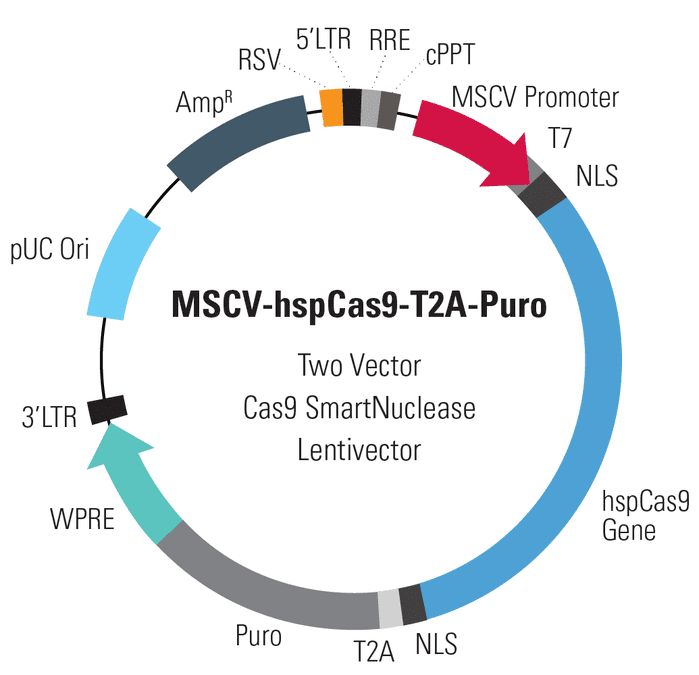 This vector drives Cas9 expression with MSCV and has Puro selection. When you want to create stable Cas9 editing cell lines and/or would like to edit the genome of a cell line that is resistant to transfection by plasmids, turn to one of SBI’s Cas9 SmartNuclease Lentivector Systems. Available as lentivector plasmids, ready-to-transduce pre-packaged pseudovirus, and in a package-your-own-lentivector kit with the lentivector plasmid and the LentiStarter 3.0 Packaging Kit, the MSCV-hspCas9-T2A-Puro Two Vector Cas9 SmartNuclease™ Lentivector expresses human codon-optimized Cas9 wild-type nuclease from the strong MSCV promoter and includes the puromycin selectable marker.